SENNA is a member of the Pea family; its medical use is as a strong Purgative and Laxative. 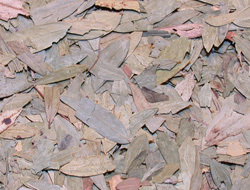 (Note that Cassia Senna is not the same as Cassia Bark (Cinnamon Bark), Cassie Flower (Acacia), or Quassia (Bitter Root). 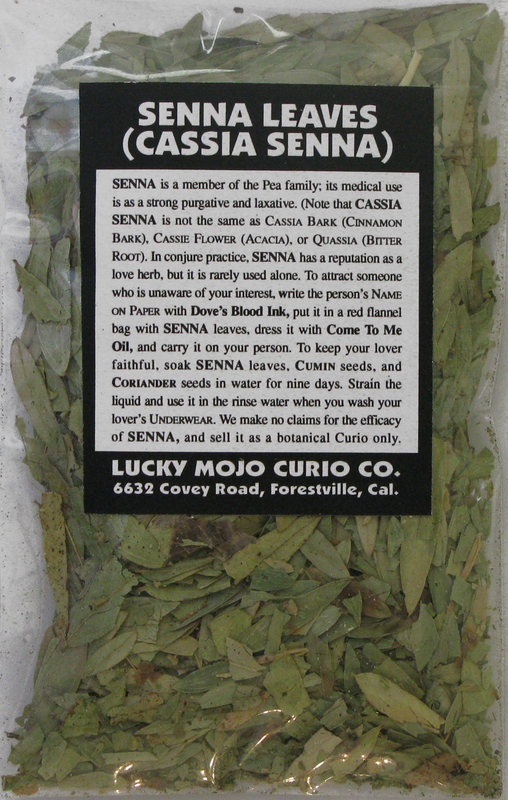 In conjure practice, SENNA has a reputation as a Love Herb, but it is rarely used alone. To attract someone who is unaware of your interest, write the person’s Name on Paper with Dove's Blood Ink, put it in a red flannel bag with SENNA LEAVES, dress it with Come To Me Oil, and carry it on your person. 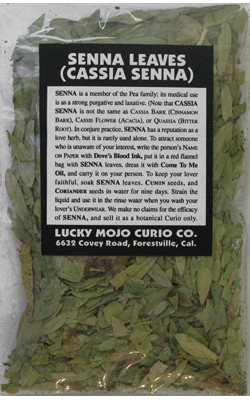 To keep your lover faithful, soak SENNA LEAVES, Cumin Seeds, and Coriander Seeds in water for nine days. Strain the liquid and use it in the rinse water when you wash your lover's Underwear. We make no claims for the efficacy of SENNA, and sell it as a botanical Curio only. 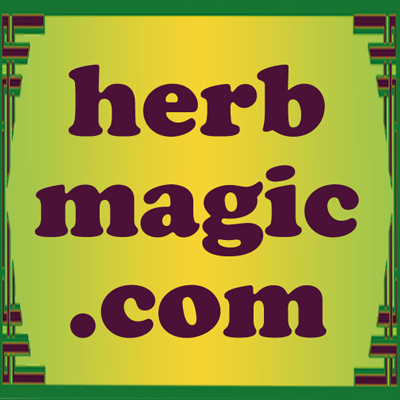 Many more folkloric magical spells utilizing SENNA LEAF can be found in the book "Hoodoo Herb and Root Magic" by catherine yronwode.